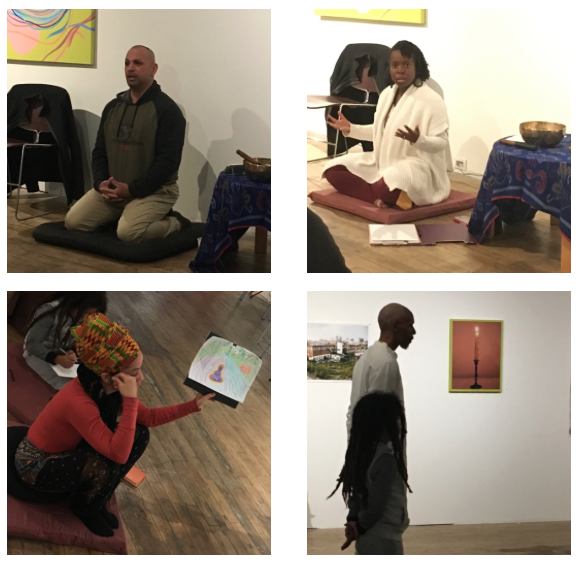 On Sunday, November 12th, Teacher Kazi opened the People of Color Retreat with a presentation on the meaning and background of Ancestral Meditation Medicine and what it means for us culturally and connectively today. Throughout the day he gently and masterfully guided us in meditation medicine through modes of sitting, standing, walking, and qigong. Andrea Lee and J. Javier Cruz both gave Dharma (truth) talks that clearly explained the meaning of the Sanskrit/Pali word dukkha, an ancient spiritual word that is hard to define. It can mean both mental and physical suffering, stress, and agitation — subtle and extreme — that we cause ourselves and others. They then used their personal disciplines to help us find the ability to let go and open our hearts and minds (note that a single Chinese character means both heart and mind). Javier taught the method of metta (loving-kindness) meditation, while Andrea used yoga discipline to allow us to radiate love out. We all seem to have joy and/or self-discovery in this session whenever we do it — expressing ourselves through drawing or written word — then explaining to our soul group (sangha for the day) how the art manifested and reflecting on its meaning. Presenters Mesha Allen and Muta Morton both expressed beautifully. Mesha read a powerful original essay in a voice like a hug and Muta instructed in a unique blend of modulating verbal performance and khemetic yoga postures. He chose those that he finds especially healing and we did too! To end the program, Kazi led us in his own variation of a chant that he heard in the film Baraka. It was first a slow “Cha. Cha. Cha. Cha.,” then a very quick-paced “chachachachachachachachacha,” going back and forth between the slow and fast. In a sense, he was using the chant as a healing form somewhat like hormesis activity. Kazi also suggested that we also try his Vowel Chant using the ancient aspiration sounds of the vowels a-e-i-o-u. It can be found on the free www.insighttimer.com App under “Meditation Medicine Chant 1”. We had a delicious vegan meal provided by Arelis Hernandez and Keven Porter of Rabbit Hole Farm. Mary Arthars assisted with lovely side dishes and logistical support. Thank you to Jennifer Becher and Bruno Mendoza for volunteering with registration and venue set-up. We were also pleased to have a 10-year-old who came with his mother who minded him thoughtfully through the day. He joined in on most everything and seemed to learn quickly. We’re grateful to Index Art Center for the venue and director Lowell Craig for his patience and time. 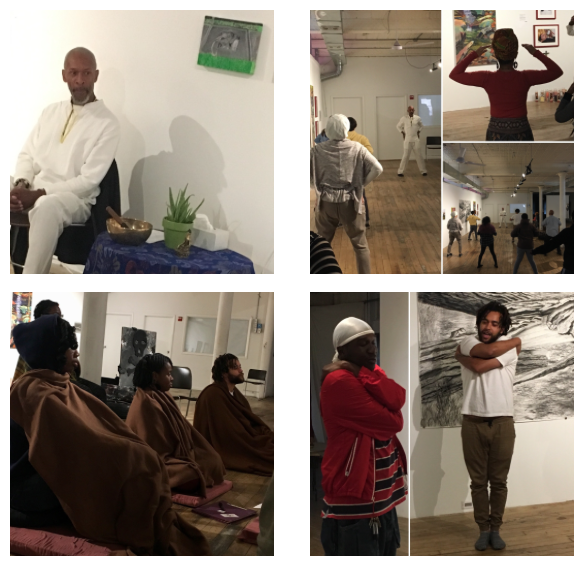 This entry was posted in Ancestral Meditation Medicine, Day-long Retreats, Meditation Medicine, mindfulness, Part-day Retreat, People of Color, Qi-Gong, Yoga and tagged #meditation, #newarknj, ancestralmeditationmedicine. Bookmark the permalink.